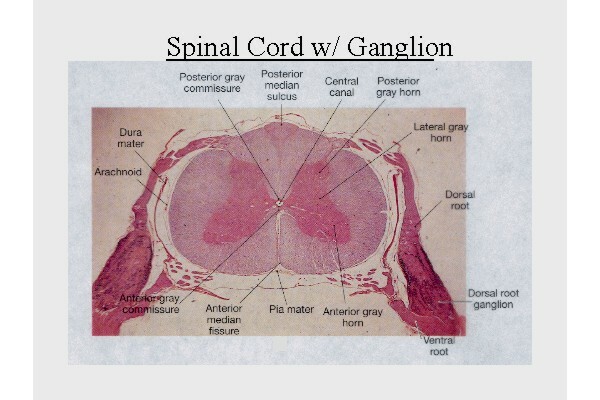 A dorsal root ganglion (or spinal ganglion) (also known as a posterior root ganglion), is a cluster of neurons (a ganglion) in a dorsal root of a spinal nerve. 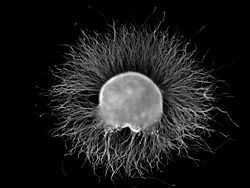 The cell bodies of sensory neurons known as first-order neurons are located in the dorsal root ganglia. ^ Purves, Dale; Augustine, George J.; Fitzpatrick, David; Katz, Lawrence C.; LaMantia, Anthony-Samuel; McNamara, James O.; Williams, S. Mark (2001). "The Major Afferent Pathway for Mechanosensory Information: The Dorsal Column-Medial Lemniscus System". Neuroscience. 2nd edition. Retrieved 30 May 2018. ^ Huang CW, Tzeng JN, Chen YJ, Tsai WF, Chen CC, Sun WH (2007). "Nociceptors of dorsal root ganglion express proton-sensing G-protein-coupled receptors". Mol. Cell. Neurosci. 36 (2): 195–210. doi:10.1016/j.mcn.2007.06.010. PMID 17720533. ^ a b c d e Cho, H.; Shin, J.; Shin, C. Y.; Lee, S. Y.; Oh, U. (2002). "Mechanosensitive ion channels in cultured sensory neurons of neonatal rats". The Journal of Neuroscience. 22 (4): 1238–1247. PMID 11850451. ^ a b c Sugawara, O.; Atsuta, Y.; Iwahara, T.; Muramoto, T.; Watakabe, M.; Takemitsu, Y. (1996). 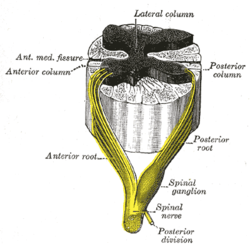 "The effects of mechanical compression and hypoxia on nerve root and dorsal root ganglia. An analysis of ectopic firing using an in vitro model". Spine. 21 (18): 2089–2094. doi:10.1097/00007632-199609150-00006. PMID 8893432. ^ Syriatowicz, J. P.; Hu, D.; Walker, J. S.; Tracey, D. J. (1999). "Hyperalgesia due to nerve injury: Role of prostaglandins". Neuroscience. 94 (2): 587–594. doi:10.1016/S0306-4522(99)00365-6. PMID 10579219. ^ Lorenzo LE, Godin AG, Wang F, St-Louis M, Carbonetto S, Wiseman PW, Ribeiro-da-Silva A, De Koninck Y (June 2014). "Gephyrin Clusters Are Absent from Small Diameter Primary Afferent Terminals Despite the Presence of GABAA Receptors". J. Neurosci. 34 (24): 8300–17. doi:10.1523/JNEUROSCI.0159-14.2014. PMID 24920633.